Binghamton University alumna Ellyn Uram Kaschak, who spoke at the Binghamton University TEDx conference in 2017, has made a seven-figure gift to establish the Institute for Social Justice for Women and Girls at the University. Image Credit: Jonathan Cohen. 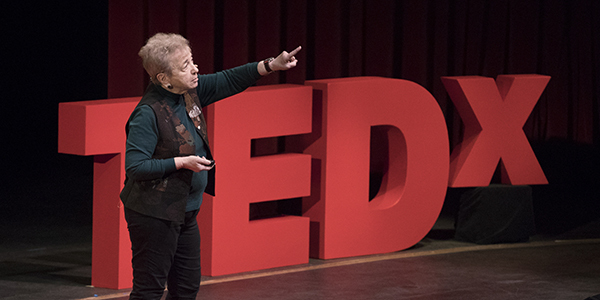 Binghamton University alumna Ellyn Uram Kaschak, who spoke at the Binghamton University TEDx conference in 2017, has made a seven-figure gift to establish the Institute for Social Justice for Women and Girls at the University. Photography: Jonathan Cohen. Ellyn Uram Kaschak grew up in the 1950s, when women weren’t supposed to go to college – except to earn an MRS degree. She came from a traditional family with no money or seeming desire to send her to college, so she found a way and educated herself. But she was challenged at every step, because she was a woman. “I don’t know what made me want to do it, but from the time I was little, I always felt it wasn’t fair that girls couldn’t do everything that boys could do,” she said. Kaschak got her education, starting with a Russian studies degree from Binghamton University’s Harpur College of Arts and Sciences. “I started in psychology and got bit by a rat, so I got a tetanus shot and changed my major and that was the start of my infamous career,” she said. That career has brought her back to Binghamton, where, with a seven-figure gift, she has established the Ellyn Uram Kaschak Institute for Social Justice for Women and Girls, to continue her fight for equality for women. “This is a wonderful investment in social sciences and humanities and what they can bring to solving really pressing problems of social justice for over half the world’s population, and we are very grateful for it and excited about it,” said Executive Vice President and Provost Donald Nieman. “The institute will create an evidence base for practice to be looked at in a scholarly way,” he added, by bringing the rigor of scholarship to what are the best practices and what works, providing a feedback loop between practice and scholarship. After graduating from Binghamton in 1965, Kaschak went on to earn her master’s degree at George Washington University and worked as a school psychologist before receiving her PhD in clinical psychology from The Ohio State University. The road to her doctorate was also a bit bumpy. Her PhD program was innovative, she said, allowing students to decide what they wanted to study and then find mentors to help them. However, gender discrimination remained an issue. Kaschak became more and more interested in gender issues, and found herself at the center of a revolution. Considered one of the pioneers and developers of the field of feminist theory, she has spent her career focused on it. Which brought her back to Binghamton and the institute she believes in. A landmark international conference is being organized for April 23-25, 2020, that will take stock of women’s rights and vulnerabilities. The “Women, Peace and Security: Re-evaluating Vulnerability”conference is the brainchild of Alexandra Moore, professor of English and co-director of the Human Rights Institute (HRI) at Binghamton University, colleagues at the Helena Kennedy Centre for International Justice at Sheffield Hallam University in the United Kingdom and a partner in South Africa. The Ellyn Uram Kaschak Institute for Social Justice for Women and Girls will join with the HRI and the Helena Kennedy Centre to host the conference at Binghamton. Being held in recognition of the 20th anniversary of U.N. Resolution 1325 on Women, Peace and Security that reaffirmed the central role of women in peace and post-conflict rebuilding, the conference will also link to the Harpur College of Arts and Sciences 70th-anniversary celebrations and recognize Ellyn Kaschak’s career and generosity. World-renowned speakers have already committed to the conference, which will be unlike most academic conferences, according to Moore. “We’re trying to avoid the typical conference format where we read academic papers and ask questions before moving on to the next panel,” Moore said. “We’re looking at more interactive formats. For example, we will have workshops on different ways survivors express gendered violence through their bodies as well as on how to read and write feminist legal judgments. How could you write a law so that it might carry with it feminist principles versus not? For more on the conference, visit the web. “When I retired, I made out my will and where my money would go,” she said, planning for much of it to go to social action groups to continue her work. “Then I thought, ‘Why wait. Do it now. I want to do it while I’m still alive and can see it happening.’ So I thought of all the institutions I have been at and Binghamton came up. Susan Strehle is the founding director for the institute. With assistance from an executive committee of faculty formed across schools and disciplines, she will develop a program supporting faculty affiliates, practitioners-in-residence, and student fellows at the graduate and undergraduate levels, all while fostering public engagement and outreach. Strehle said the first job of the institute will be to put out a call for proposals supporting research in this field to faculty and students. The institute will support new and ongoing research projects. “One of the challenges is to bridge solid academic research with the need to make a ‘real-world’ difference,” she said. “Scholarship in some fields is designed for other academics. But a project that begins as an academic analysis can have clear social outcomes and, in the classroom, all of it does because of the way we teach students and talk about women and girls. Strehle sees the institute empowering research in many different fields that will contribute to Kaschak’s activist vision of a direct, positive impact on the lives of women and girls. Kaschak will return to campus early in the fall semester to help launch the institute. Now professor emerita of psychology at San Jose State University where she taught from 1974 to 2009, she is also a visiting professor at the University for Peace in Costa Rica, where she lives half of the year. Author or editor of 14 books including Engendered Lives: A New Psychology of Women’s Experience (1992), and Sight Unseen: Gender and Race through Blind Eyes (2015), Kaschak also edited the quarterly Journal of Women & Therapy for 20 years. She continues to write a blog for Psychology Today and a column for an international journal – and is currently working on a memoir. Read coverage of Kaschak’s 2017 TEDx talk at Binghamton University: Seeing is Believing, or Is Believing Seeing?